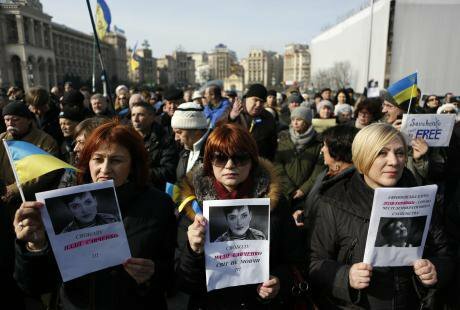 March 2016: 2,000 people rally in support of Ukrainian pilot Nadiya Savchenko at Independence Square in Kiev. (c) Sergei Chuzavkov / AP / Press Association Images. All rights reserved.Under Ukraine’s pre-Maidan criminal regime, any pressure on journalists used to provoke a wave of indignation. This indignation, which came from journalists, human rights defenders and civic activists themselves, even became a precursor to the first Maidan in independent Ukraine — the protests under the banner of “Ukraine without Kuchma”. 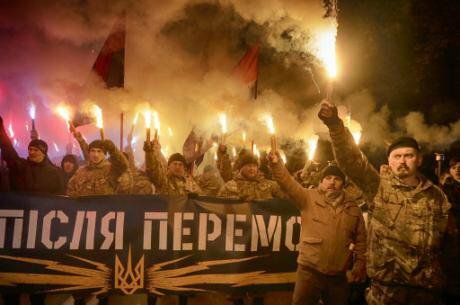 14 October: Volunteers of the Azov Civil Corps light flares as they hold a banner reading "Peace after victory" during a rally marking Fatherland Defender Day in Kiev. (c) Efrem Lukatsky AP/Press Association Images. All rights reserved.Something really has happened to us — Ukraine has changed after the last Maidan. From a country that stood out for its level of civic freedoms on the territory of the former USSR, it is transforming into a copy of the Russian Federation in terms of the suppression of those freedoms. 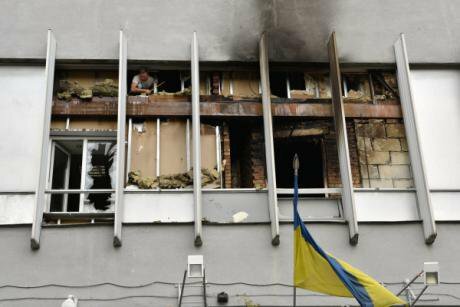 4 September: the Kyiv headquarters of Inter TV, a major Ukrainian broadcaster, suffers an arson attack. (с) RIA Novosti. All rights reserved.In other incidents, ultra-right activists, openly racist and Nazi (such as Azov) formations have themselves attacked television stations such as Ukraina and Inter, social protests, anti-war meetings, meetings with left wing and antifascist banners and symbols, actions of the LGBT community. As a rule, these attacks take place with the police passively standing by. 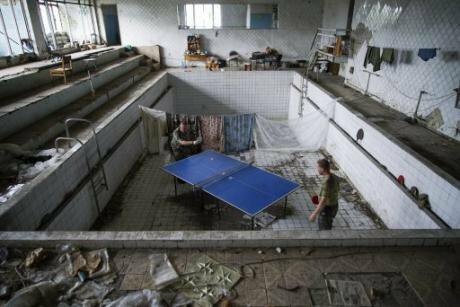 August 2016: Ukrainian soldiers play table tennis at a damaged swimming pool in the village of Marinka, near Donetsk. (c) Max Black AP/Press Association Images. All rights reserved.The division of people between “us” and “the enemies”, characteristic of a state of war, is a foundation for repressing those that “patriotic” movements place in the opposing camp. You can then remove their civil rights, or it may indeed be necessary to do so. Otherwise they might overwhelm you. Originally published in Ukrainian on 20 October 2016 in Commons: Journal of Social Criticism.